The dyepots have been put away & my thoughts now turn to preparations for the arrival of family & friends who will be spending the festive season with us. So this will probably be my final entry for the year & I thought I would end with some images that are typical of the winter season here. 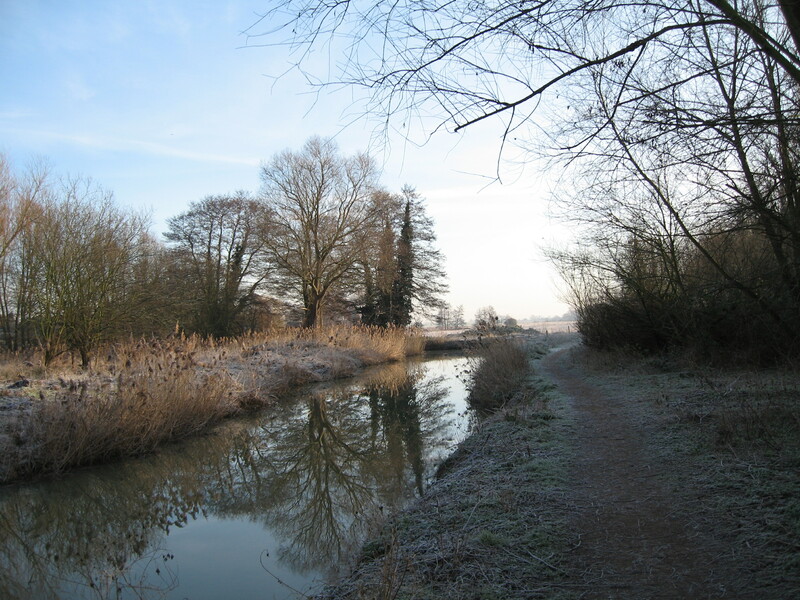 These 2 photos, taken near our home, show the East Anglian landscape in Winter. 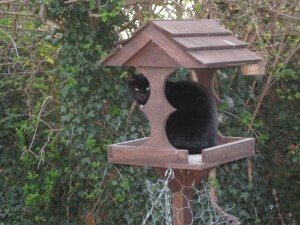 This last photo shows our ever-optimistic cat in her characteristic winter role as guardian of the bird table. Note the chicken wire, intended to impede her access to the bird feeding area & which she clears with a single leap, despite her 13 years. 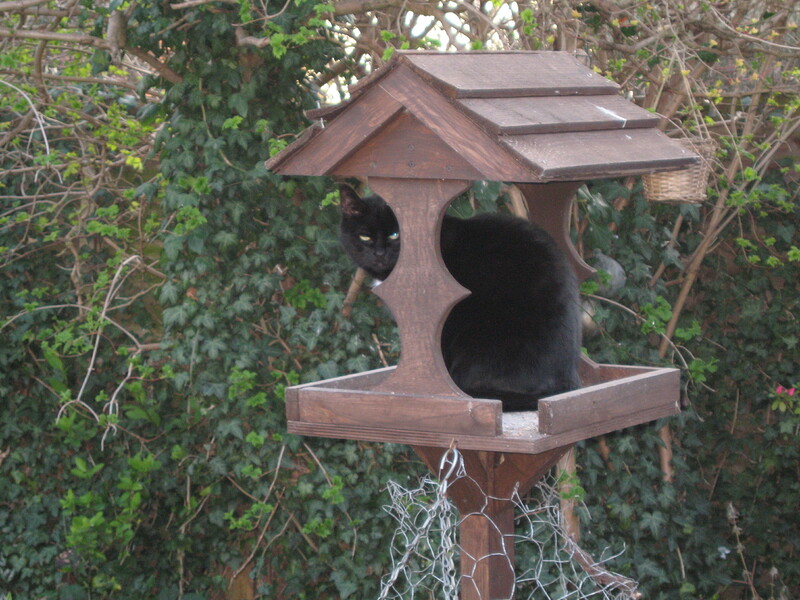 The landscape may be grey & dull at this time of year but our cat’s optimism, as she waits in vain for an unsuspecting bird to fall into her open mouth, seems to sum up the hope we have that the New Year will bring good things for all of us. I wish everyone all the very best for the festive season & for the New Year & I hope you will continue to follow my blog next year. This photo shows the results of my most recent tests using sorghum extract, this time on unmordanted wool. Unfortunately, the telephone called me away from the dyebath, which boiled too vigorously for too long, resulting in much darker shades than I had intended. However, I think it’s just about possible to see the results of the colour modifiers. From top to bottom: No modifier, acidic modifer (clear vinegar), alkaline modifier (washing soda), copper modifer, iron modifier. I think sorghum could prove an interesting dye source & I must try it again – but next time without boiling the dyebath to within an inch of its life! 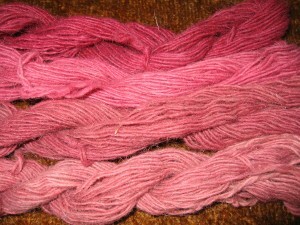 This photo shows some shades, on alum mordanted wool, from Lac Red on the left & from Lac Purple on the right. (Both available from Pure Tinctoria). I was interested to see how separating the red & purple pigments would influence the resulting shades. Colour modifiers resulted in pleasing variations in shade. Both copper & iron made the colours more purple in tone &, as usual with Lac dye, an acid modifier intensified the colour & an alkaline modifier made it considerably paler. This is interesting, as with most other dyes the results are reversed & the alkali intensifies the colour. In fact, the only other dye I can recall where this effect is noticeable is walnut hulls. Here, too, a vinegar after-bath deepens the shade. 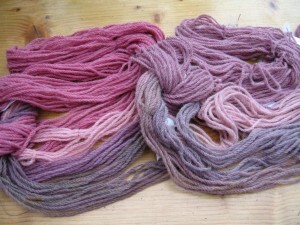 This photo shows the results of another test I carried out on the Lac dyes. This time, before adding the alum-mordanted fibres, I added clear vinegar to the prepared dyebath to bring it to pH 4. I then added the fibres & simmered the dyebath for about 30 minutes as usual. 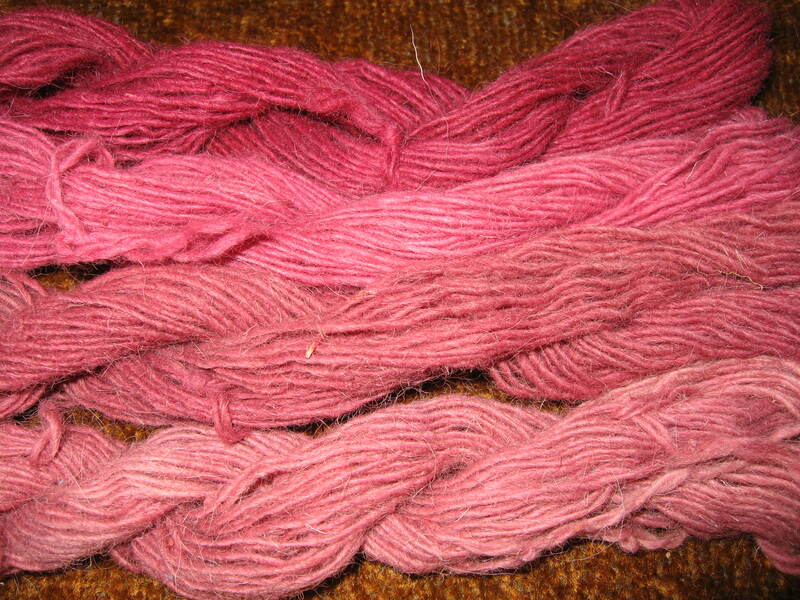 The top 2 skeins are from Lac Red (dyebath & exhaust dyebath) & the lower 2 skeins are from Lac Purple (dyebath & exhaust dyebath). The addition of an acid, either citric acid granules or clear vinegar, is a useful way of extracting the maximum dye pigment from insect dyes & works with Cochineal as well as with Lac. However, it tends to produce shades that are redder or more orange in tone, rather than pinker or more purple & if too much acid is added the colour can easily become too orange in tone. Black dye technique: Split yellow juncus is submerged in old cast iron pot with crushed up oak galls and rusty nails. Leave outside for 2-3 weeks. When you remove dyed juncus, let mixture in pot dry up, then re-use just like a soup stock the next time you dye. This photo & the description come from Timara Lotah Link, of the Santa Barbara Chumash Indians in California. Tima contacted me to ask my advice about preventing the Juncus textilis reeds used in their basket weaving from becoming brittle as a result of the iron/tannin dyeing process. The tannin/iron complex, used to achieve black through the combination of tannin from a plant source & iron, often from iron-rich earth or mud, is one of the most ancient & most widespread dyeing techniques. It is used traditionally all over the world, from Aboriginal tribes in Australia to Native American Indians in North & South America, & also throughout Africa, mainly to dye reeds & grasses & sometimes to paint designs on cotton fabric. Its only drawback is that iron tends to have a damaging effect over a period of time, most noticeably on animal fibres & less so on vegetable fibres. However, this damage may take many decades to become apparent & may not be noticeable during the lifetime of the artefact, especially if it is a well-used basket. I saw something similar when working on a dyeing project in Zambia in 1988. There, the basketmakers “sandwiched” the reeds they used for weaving their baskets between layers of the tannin-rich leaves of a local tree, Terminalia sericea. These “sandwiches” were then buried in the iron-rich mud at the edge of the local river & left for a few weeks to become black. I think what Tima describes is basically the same. The black mud would be rich in iron & if the Juncus itself contains enough tannin, that would be sufficient to achieve the tannin/iron complex needed to dye the reeds black. Otherwise, extra tannin from another plant source would need to be added. I think the action of the iron-rich mud would be gentler & less corrosive than that of a mixture containing rusty nails. The ideal method might be to imitate the dyeing techniques of the earlier Chumash by adding some iron water to local mud, perhaps with the addition of tannin-rich leaves or oak galls, & experimenting with that. I hope I have been able to offer Tima some helpful comments & that she will contact me again with any other queries she may have. 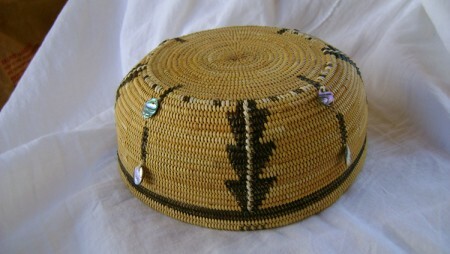 The basket hat is such a beautiful piece of traditional weaving & it would be a real privilege if I have been able to contribute anything useful. Readers of my latest book “Colours from Nature” (details on this blog under “Publications”) will probably notice that my recipe for mordanting animal fibres with alum has changed slightly. I now use 10% alum & no cream of tartar, instead of 8% alum + 7% cream of tartar. The reasons for this are as follows: cream of tartar, potassium hydrogen tartrate not the culinary sodium pyrophosphate, was difficult to obtain here for a while, so I got used to mordanting without it. After some experiments, I found that alum used alone at 10% (i.e. 10gms alum per 100gms fibre) seemed the lowest % of alum that gave good results, so I adopted this as my method of mordanting animal fibres. When I started using cream of tartar again, I found that for some reason it wouldn’t dissolve properly & remained as a sludge at the bottom of the pan. So I decided it was simpler (& less wasteful) to use alum alone. 10% alum works well & is very convenient if you make it into a solution as I explain in the book. With a solution of 100g alum dissolved in 1 litre of boiling water, when you use 10% alum, you use the same quantity of alum solution in mls as weight of yarn in gms. E.g. To mordant 450gms wool you need 450mls alum solution. This seems so much simpler & the results are just as good, in my experience. 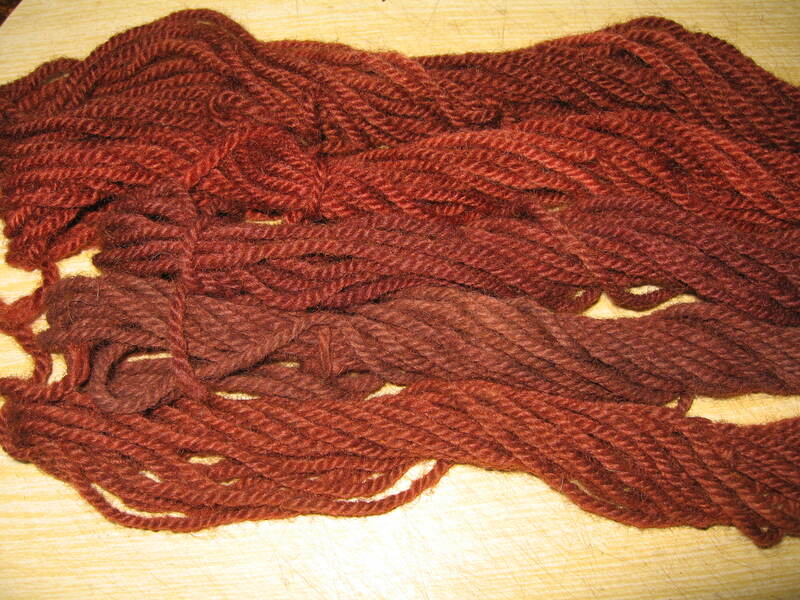 In fact, with some dyes, such as madder, I think the results are better. And the alum solution can be stored indefinitely in a glass or strong plastic container with a well-fitting lid. Also. it seems much easier to measure out a liquid than a powder. But of course, if you have your own preferred recipe for alum mordanting, then that’s the best method for you. Recently it has become possible to obtain aluminium acetate in the UK & this has made mordanting vegetable fibres, & also silk, so much easier. 5% alum acetate used in a single process can replace the more time-consuming tannin & alum mordanting processes commonly used for vegetable fibres. Aluminium acetate is widely used in Japan as a mordant for silk & I have found it to be excellent for both silk & vegetable fibres. PS One last comment: Before I throw away the used 10% alum mordanting bath, I usually add one final skein to it & mordant it as usual. I label it “alum exhaust”, just in case there wasn’t enough alum left to have even a tiny mordanting effect, & then use it with a dye, such as madder, which will fix both with & without a mordant. 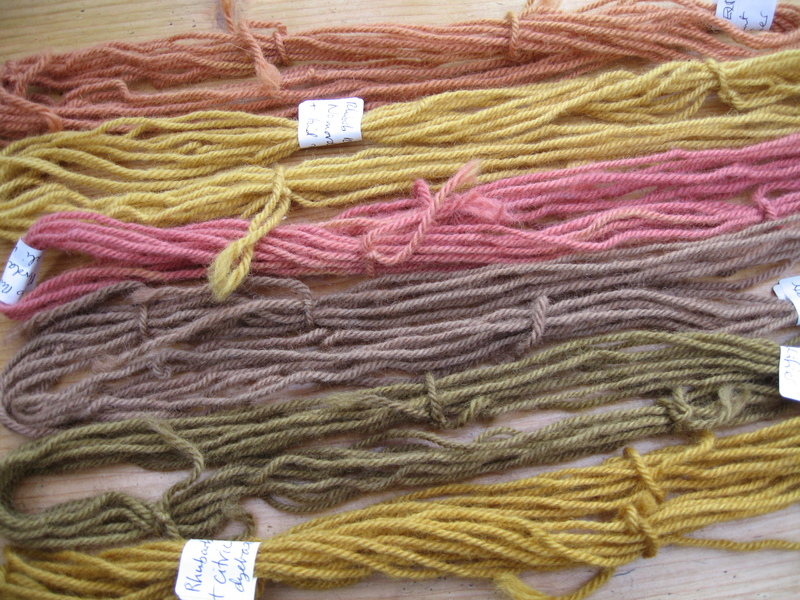 With the exception of the pale pink skein (dyed in cochineal on an alum mordant) & the pale blue skein (dyed in indigo), this photo shows some colours achieved from various dyes, using rhubarb leaves as a base or alternative mordant. The reddish colours are from madder, the pinker shades are from cochineal, the brown & tan colours are from cutch & the greeny-blue shades are from indigo. 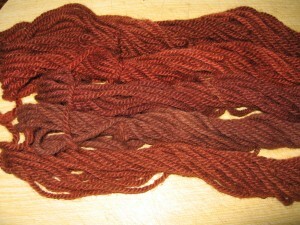 The wool skeins were first treated in the rhubarb leaf solution, then dyed. No other mordant was used. Following a comment on my latest entry on Rhubarb Root, I thought it might be useful to clarify the difference between rhubarb leaves & rhubarb root. Rhubarb root is a very useful dyestuff, more suitable for animal, rather than vegetable, fibres, & it can be used both with or without a mordant. Used with colour modifiers, it gives shades ranging from yellow & rust to pink, red-brown & green. It doesn’t seem to matter what species of rhubarb you use. I use the roots from the edible rhubarb I grow in my garden for pies etc. Some people use the roots of ornamental rhubarbs. The rhubarb root sold commercially often comes from China & is used as an ingredient in laxatives or purgatives. Rhubarb leaves, which contain poisonous oxalic acid so should be handled with care, can also be used as a dye on mordanted or unmordanted fibres, but they tend to give only a pale yellow colour. 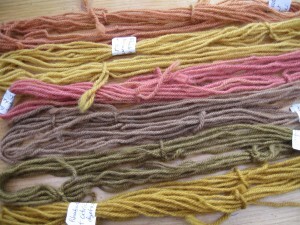 Their main use is as an alternative mordant or base for other colours. They work well on animal fibres but are not really recommended for vegetable fibres. Rhubarb leaves are widely used as a base for other colours by Tibetan carpet weavers, working in Himalayan regions where chemical mordants are often difficult to obtain. They are also used to assist fermentation in indigo vats. Full information for using colour modifiers is given in most of my books. For details of my latest book, “Colours from Nature”, see under “My Books” on this blog. Some information on modifiers is also given here in the entry “Colours from Dahlias”. Basically, colour modifiers are used after the initial dyeing process to alter or modify the shades. So if you dye 5 skeins in the same dyebath, leave 1 skein unmodified, then apply a different modifier to the remaining 4, you will end up with 5 differently coloured skeins that all tone together. Modifiers may be pH alterants: acids like clear vinegar, citric acid, lemon juice; or alkalis like washing soda, soda ash or wood ash water. (See below) The other modifiers are solutions of iron or copper. 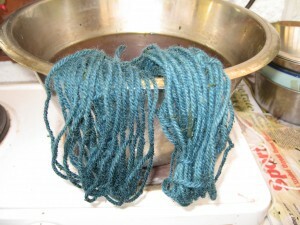 A small quantity of the modifier is added either to a pot of water or to some of the used dyebath. The dyed materials are then added to these solutions (1 to each) & left to soak until a colour variation is achieved. If nothing much seems to be happening, just add some more modifier & continue with the soaking. Sometimes the colour variations are dramatic, sometimes they are more subtle & on occasions it’s difficult to notice much change at all, especially with acidic modifiers. In my experience, the most useful modifiers are the alkalis & iron. You can also heat all the modifier solutions EXCEPT THE ALKALINE MODIFIER. If you heat this, you may damage or even destroy animal fibres such as wool. BE WARNED! NOTE: Wood ash water is made by removing the ashes from a wood-burning stove & soaking them in water for a week or two. The ashes sink to the bottom, leaving a yellow liquid which is strongly alkaline. You can tell when it’s ready because it will feel slick or slimey to the touch. Just remove the solution without disturbing the ashes & use half to one cupful as your alkaline modifier. At last I’ve managed to find time to try out the colour modifiers on the rhubarb root extract dye that I wrote about earlier. 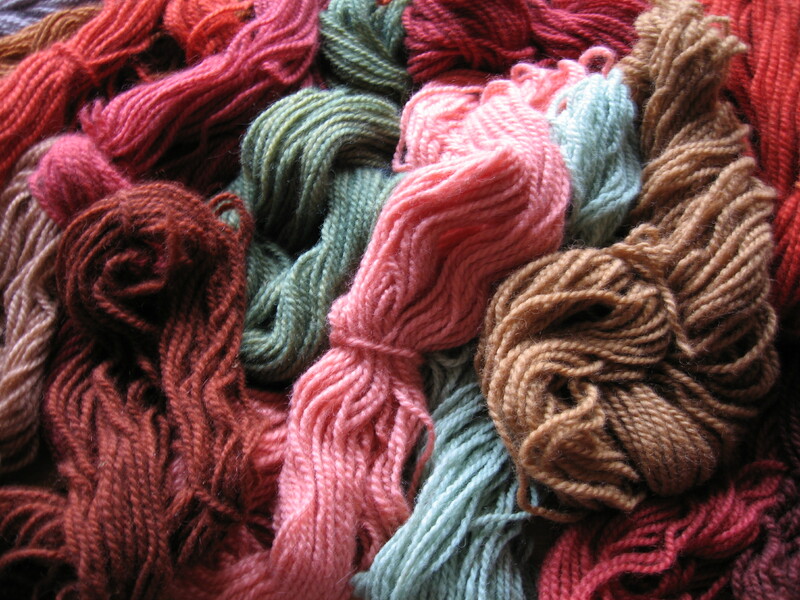 The samples are on unmordanted wool. The photo shows from top to bottom: No modifier, acidic modifier (clear vinegar), alkaline modifier (washing soda), copper modifier & iron modifier. (Note: I always put the modified samples in alphabetical order – acid, alkali, copper, iron). The last sample is from a different dyebath, made by adding an acid (this time citric acid granules, but clear vinegar would have been equally good) to the dyebath before dyeing. I added enough to turn the dyebath yellow, rather than rust, in colour. 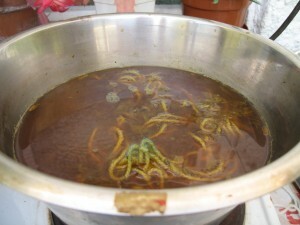 However, take care not to add too much or the colour may be too pale, so add it gradually.The unmordanted sample was then added & simmered for about 20 minutes. This latter method is a useful way of getting a clear yellow from rhubarb root, in either extract or plant form, without having to use an acidic modifer afterwards. If you dye several skeins in the acidified dyebath, they can be modified as usual, although little change occurs from an acidic modifier. I was delighted with these results, as rhubarb root is such a useful, versatile dye, especially as it can be used without a mordant. It was good to know that the modifiers are effective when used with the dye in extract form. Today the weather is cold, dull & gloomy, so I just wanted to remind myself of that chilly but bright day in November when I made a final vat using my home-grown woad leaves. 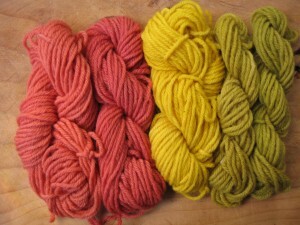 Here are some of the skeins I dyed that day, hanging outside to dry. Stored away in my shed I still have some woad solution, to use whenever the mood takes me or when the brighter weather draws me outside to set up my dye pots. Woad solution is easy to make & can be stored for several years. All you do is follow the instructions for using fresh woad leaves, given in my earlier entries, up to & including the whisking to produce the blue froth. Then leave the solution for a while to allow the froth to settle. It’s important to make sure all the froth is incorporated into the solution, as the froth contains most of the blue pigment. Then pour the solution into a strong glass or thick plastic airtight container with a well-fitting lid. (If you use a plastic container, make sure it is made of thicker plastic than those containers used for milk. I have found that, if the plastic is too thin, the blue pigment is absorbed by the plastic, which becomes a deep blue, leaving little pigment left to dye anything else.) Allow the solution to overflow slightly, then screw the lid on well. You can add a teaspoon of sodium metabisulphite as a preservative if you like, but I’ve never found it necessary. I have successfully stored woad solution in my shed for several years & it never seems to develop mould or deteriorate in any way . 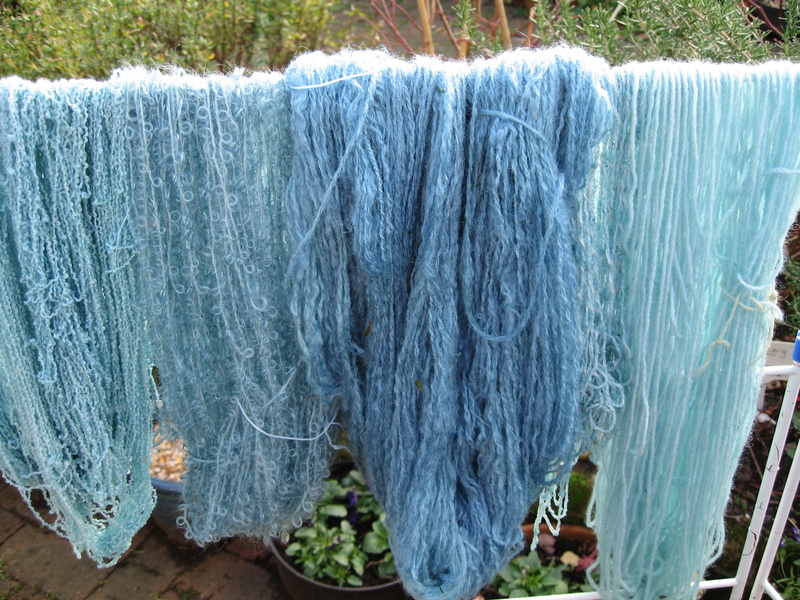 The photos show (left) the vat with the blue colour beginning to emerge as the yarn appears above the surface & (right) the yarns with the blue dye developing. Last week Ian Howard, the woad grower from Norfolk, sent me a few woad balls to experiment with. Woad balls are rare nowadays & I believe they may only be available commercially from Ian. Of course, woad is simpler to use in powder form & it is only recently that woad powder has become available. Before that, dyers keen to use woad had to grow their own. Until the 1930s woad was grown & processed in England in the fens in East Anglia, not far from where I live. The woad balls were made by crushing the leaves to a pulp between rollers, draining off any excess liquid, then rolling the pulp into balls, which were laid on racks to be dried. Sometimes woad was traded as balls, which then had to be processed further into couched woad before they were ready for dyeing. To make couched woad, the balls were pulverised, sprinkled with water & left to ferment. During this period, the mass was turned frequently & large lumps broken up. Finally, this crumbly substance, known as couched woad, was dried & packed into barrels, ready to be sent off for sale. But back to my woad balls. As I want to save some for a fermentation vat when the weather is warmer, I just used one for this test. I was surprised at the amount of blue there seemed to be in this one ball, even after I had been distracted by a phone call & let the vat simmer on the cooker – absolutely not a good idea! Not only that, the vat kept going over several days & didn’t seem to mind getting cold overnight & being heated up next morning. Basically, as I wasn’t planning a fermentation vat, I followed the same procedure as I use for dyeing with fresh woad leaves, except that I left the leaves in the vat throughout. So first of all I broke the ball into small pieces by bashing it with a mallet (yes, woad balls can be very hard indeed!). Then I poured a little cold water over it to just cover the pieces. I did this as a precaution, in case “shocking” it with boiling water destroyed any dye potential, although I think it would probably have been OK to start off with the boiling water. Then I poured boiling water over the pieces, about enough water to make a small vat, & left them to steep for about an hour. I then strained off the liquid, added enough washing soda (sodium carbonate) to turn the liquid from brown to greenish & began the whisking process. At this point, I should say that the smell was quite strong but, as I love the smell of woad, it didn’t bother me at all. Also, the whisking process produced no sign of any blue froth but I decided to continue, as I seemed to recall having had this experience before. After whisking for about 15 minutes, I decided to return the pieces of woad ball to the liquid & then I whisked a little more – still no blue froth. I then poured the liquid, plus woad ball pieces, into a stainless steel pot & set it on my cooker. I heated it gently to about 50C/120F (or as hot as the hand can tolerate for a count of 3 – what I call “1,2,3 ouch!”) & then added some sodium hydrosulphite to remove the oxygen. After about 10 minutes, I decided to add some wool to see if any blue had developed & was delighted with the results. The first skeins were a deep blue/green, later skeins became a little paler, & one skein was a delicate green. The colours on the second & third days were just as strong as those on the first day – probably because leaving the leaves in the vat allows the blue to continue to develop as time progresses. 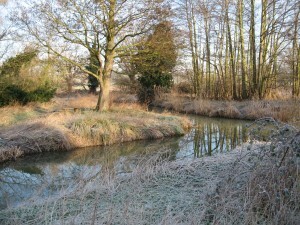 This vat does not look like the usual woad or indigo vats; the colour of the liquid is a murky brown/yellow, although a blue metallic sheen does appear on the surface after a while, only to disappear again later. Neither does this vat give the same shades of blue as woad vats from fresh leaves or woad powder. The blues are tinged with green, so appear more turquoise, although this is not apparent from the photo above. (However, it’s very difficult to show colours absolutely accurately in photos, unless one has sophisticated equipment & considerable skill & I have neither, I’m afraid, being a complete novice where photography is concerned.) I imagine these colours are probably influenced by the other pigments present in the leaves, such as those that give the tan shades when woad leaves are used following the usual simmering method, & the green tones occur because the leaves remain in the vat throughout. I suppose I need to do another vat without the leaves in, to see what happens without them – perhaps at a later date. I also suspect that these greeny-blue shades may be closer to the blues our early ancestors achieved when using the fermentation vat method. To sum up: Woad balls can be used in the same way as fresh woad leaves, except that the leaves should remain in the vat throughout. Whisking may not produce any blue froth but ignore this & continue as usual. The vat itself will not look like the more usual woad or indigo vats, but this does not seem to be of any importance. The vat can be kept going over several days & the colours from this type of woad vat will be more green in tone. This is turning out to be a much better experience than I had expected, mainly because so many lovely people have responded so positively to my presence on the web. I still find it hard to believe that my books are known in so many countries around the world. Also, I’ve been directed to some other natural dyeing blogs or websites & I’m discovering a new world of exciting colours & images. When I added my “favourite” websites to my blog, I was thinking of sites that might be useful to other dyers, more as sources of dyes & materials than as links to other blogs. It was Helen Melvin who kindly pointed me in the direction of Leena Riihela in Finland, whose website & blog have really inspired me – not least to order some Finnsheep fleece & some wonderful mittens (among other things) as my Christmas present from my husband. I’m beginning to realise just why so many people become addicted to the web! All the websites & blogs I’ve visited seem to have so much to offer, that I fear I shall be sorely tempted to spend time reading & looking, rather than adding to my own blog. So thanks again for all the responses I’ve had & all the directions to the delights to be found on the web. You can share some of these delights by clicking on the links given on the “Comments” pages – but I expect you know that already.